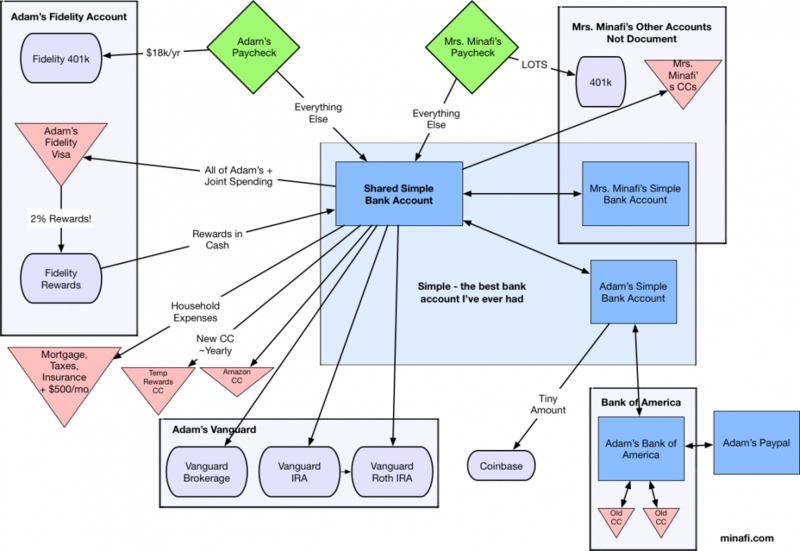 A map of what accounts I currently use and how money flows from account to account. This includes a handful of credit cards, 4 bank accounts, and entirely too many investment locations. Written by Adam on September 7, 2017. Updated April 24, 2019. 6 min read. Financial Independence. 7 comments. I’m always trying to minimize my accounts. The feeling of having all of my financial accounts well organized and on cruise control is a relief to me, and I aim to keep these in balance. When a new account enters my radar with a benefit – perhaps a reward for use in the first few months – I weigh that against how much work it’ll be for me to do it, and how much it’ll complicate my accounts. I thoroughly enjoyed a number of other posts describing where people were putting their money and decided to do the same! Let’s dive a bit into these. I’ll level with you — this blog is too new to make any money. I’m also fortunate enough to be working a job I love that I’ve been at for almost 7 years. A few years ago I came to the realization that this could be the last job I ever work at, and something in me changed at that realization. I wanted to make things better there and wanted to enjoy time and enjoy being with people more. It’s the same feeling as when you’re moving away and you want to take in as much of a city as possible. I have no plans to leave – and whenever that happens (5 years? 10 years? sooner?) I’ll know I enjoyed my time there. Mrs. Minafi and I were married earlier this year (after 11 years together) and one of the first financial things we did was open a shared Simple account. I love the way these work. I have my own personal Simple account, as does the Mrs. I can’t see what’s in her account, and she can’t see what’s in mine. We can transfer from our accounts to the joint, or vice-versa instantly. I don’t trust Paypal. I’ve heard too many stories of peoples bank accounts being frozen by scammers complaining to Ebay and them taking their side. Because of that, I’ve separated Paypal from my “real” account with my old Bank of America account. I keep this one around to have an in person bank. It’s helpful for cashing physical currency, writing checks and a few other things like no-fee ATMs. It’s easy to transfer money between this and Simple. The fact that my company 401k and my default credit card both show up under the same account is pretty awesome. The Fidelity Visa Rewards Card gives 1% cash back when you spend and 1% cash back when you pay off the balance. This card has an international fee when using it in foreign countries, but the cash back more than covers it. Every month or two the cash back will be automatically deposited into a cash position in the Fidelity Rewards accounts. Every few months I transfer this to Simple. Vanugard is the workhorse of my investment accounts and where 92%+ lives. I love Vanguard, and use them for my IRA (currently at $0), Roth IRA and brokerage. I’m phasing out the brokerage account here now in favor of opening a joint brokerage with Mrs. Minafi. For now, we’re accumulating cash with the intention of opening that up after some larger expenses that might come up later this year. Once those are dealt with, we’ll open the joint Vanguard account. I already mentioned the Fidelity Visa, which is the default card for all payments I make. I have 2 old Bank of America cards I keep around for credit score purposes, and an Amazon Store Card which gives 5% off all Amazon purchases. I recently picked up a new American Express but dropped the ball on using it in the first 3 months. I prefer to not focus on churning and instead get cards that I’ll plan on using from then on out that have no fees. Either that or getting the card with a specific vacation in mind — that way I’m motivated to use it. My 30yr mortgage has roughly 28 years left. I’ve been paying more than the minimum on this one though, with the intention of paying it off in 7 years. That seemed to be just about the right amount per month when I did the math. When I ran the idea of paying off my mortgage through the Personal Capital retirement planner, I was able to get a slight boost when paying it off in this way. There’s a bunch of things that I’m not including on here because I just don’t have them. Anything related to kids, auto loan, HSA, FSA – all not in the cards. This does keep the chart relatively simple at least! What about you? What does your money map look like? Ours is pretty similar, with a few extra savings accounts for targeted goals. Do you separate your money that way, or do you just keep things organized on a spreadsheet (or some way else)? I always am curious to know what sort of savings accounts people have set up and how they’re tracking progress toward goals, especially if they just lump all the money together. I just talked to the wife about putting one of these together for us and she loves the idea. I think it’s a great tool to use to talk about your financial picture with your spouse, especially after you get married and are combining finances, or just in general for emergency planning, etc. We keep all of our “goal” money in the shared Simple checking. Simple has a “goals” feature, we can earmark money for a goal – either now or in the future. If it’s in the future, money will be moved that “goal” at an even pace until the goal is filled up. Money in “goals” is still spendable from checking, and is a part of the account balance, but Simple also has a “safe to spend” account balance which includes BALANCE-GOALS. We use this as the amount we have to work with, but if we go over we don’t get overdrafted. Very true on the getting together to create this. I’m actually not aware of all of Mrs. Minafi’s accounts (although I think I am). It’d be extremely handy if the worst happens. I don’t trust PayPal either!!!!! I’m so glad someone shares my view. I’ve heard those stories too where they froze and refused to give any money on the account. Why do we need the middle man of PayPal any way? Isn’t that what credit card is for? Great money map! I want to make mine! Thanks! Too true on the CC+PayPal side. Every transaction I make on PayPal is a CC payment. The only times when a bank comes into play is when selling something on Ebay. Thanks for sharing Adam. I’m a newbie when it comes to personal finance and would also want to come up with something like this for my family, easier to show the wifey where and how our finances should work. Also agree on the paypal issue, but sadly since i’m doing ebay selling to accelerate my debt payoff, that’s the most convenient way they pay you, i disconnected it from my main account though so appreciate that tip. Appreciate the wisdom here, look forward to seeing more, Cheers. Nice work, Adam! Looks a bit familiar – we have Fidelity and Vanguard too. Agree on having a shared account – sooo much easier to manage the budget that way.